Like North Africa and the Middle East today, continental Europe in the 1840s consisted of monarchs ruling impoverished masses who were suffering acute economic distress. Political liberalization was inching along too slowly to satisfy the intelligentsia and the new middle classes in the cities. In Paris, 163 years ago last month, the regime threatened to put down a peaceful protest, which resulted in thousands of angry protesters taking to the streets and demanding democracy. The mobs swelled, streets were torn up, demonstrators fraternized with national guardsmen, relatively small numbers of protesters were killed, the army didn't intervene  and within days, King Louis-Philippe had abdicated, a republic was declared, freedom of speech was allowed, and elections were scheduled. A decade earlier, what happened in Paris might have stayed in Paris. Instead it triggered a continental wave of democratic revolution, with the news spreading rapidly by new technologies: the electric telegraph, newspapers printed by steam-powered presses, railroads. A week after the startling French success, protests arose in Munich, driving out the Bavarian King, and a week after Munich, protests erupted in Berlin, the Prussian capital, where troops attacked demonstrators. But then the King withdrew his soldiers, ended censorship, appointed a liberal Cabinet, agreed to parliamentary elections and fled the city. The wave hit Vienna, the capital of the Habsburg Empire, forcing the great power broker Metternich to resign. 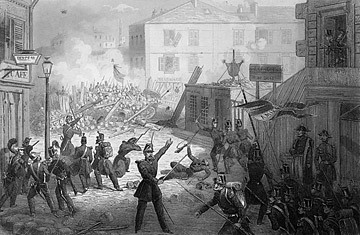 Then came days of street fighting in Milan, which caused the occupying Austrian army to retreat, and a rebellion in Venice forced out the Austrian rulers there. Only a month had passed since the Paris uprising, and the revolutionary tide kept rolling all spring in dozens more places. But as we look at the parallels with this year's uprisings in North Africa and the Middle East, we should remember what came next. In France, the radicals pushed too far too fast, essentially demanding socialism and provoking a backlash. Elsewhere the empire simply struck back. By fall, most of the revolutions had been reversed; the rest were crushed within a year. And in 2011? We'll know soon enough. See a PDF graphic about the parallels between Europe in 1848 and the Middle East in 2011.